Eddy Kim Debuts with "2 Years Apart"
Mystic89, the record label founded by Yoon Jong-shin just debuted their first male rookie artist, Eddy Kim. Eddy Kim first got his start on the talent show “Superstar K4” where he made the top 6 and gained recognition as the singing soldier. This pre-release MV for “2 Years Apart” marks the introduction of Eddy Kim, and it showcases his talents tremendously. 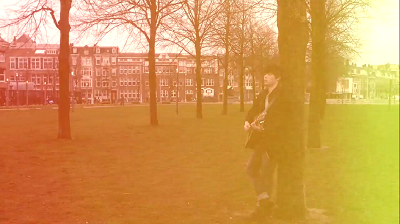 Filmed in the Netherlands, this MV utilizes the overseas locale to set a scenic background to a vocally rich song. 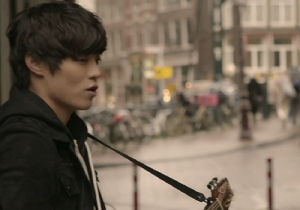 One aspect that immediately stands out in the MV is the portrayal of Eddy Kim immersed within the Netherlands community. The camera plays a silent viewer as he makes his way through different locations. The color palette is earthy and understated, giving the video a relaxed vibe. There is a mixture of overexposed shots coupled with vivid shots of the city. He is seen playing and talking to some folks in a club, riding a bus, and playing his guitar on a street corner. It is the perfect coffee house formula. The scenery never overtakes the song, so the video has no big surprises. The MV holds viewer interest by showcasing unique sites where he heads — into record stores and down busy, populated streets. What this video does well is injecting the interaction of Eddy with his environment. The shots of the environment are interspersed with him playing his guitar in comfortable areas. These are on a stoop, by the waterfront, in a park, a cozy club and in an alleyway. The destination may be international, but the locales are more familiar. It is where you expect an aspiring musician to make their mark, and Eddy Kim’s acoustic led song fits that bill. The video never takes over the song; moreover, the focus on the music is important to note. “2 Years Apart” is musically very organic sounding. The instrumentation is sparse. The acoustic guitar drives most of the song while there is a consistent maraca-like beat that gives the song a smooth rhythm. Harmonious backing vocals help to emphasize the chorus. The soulful voice of Eddy Kim makes this song refreshing. It is full on the verses and lingers on the ends just long enough to be distinctive. At times it almost has an R&B sound during breakdowns where his layered vocals call back and forth with his full voice. However, the song never gets overly ostentatious. Instead, the choice to keep it minimalist serves the song well. By keeping it simple, the tone stays warm and earnest. The overexposure is utilized to great effect in this video. It is supposed to bring about nostalgia and mixed with vibrant shots of the city life skews the sense of time. The lyrics of this song deal with time inhibiting his pursuit of love. Eddy Kim sings about his impatience at reconnecting with his love interest after his military service is over. He is desperate for that time when they were together, but now they will be two years distanced in space and time due to his enlistment. The lyrics work with the overexposure in highlighting this aspect of the lyrics. These shots in conjunction with quick cuts emit a sense of elapsed time. It is not only remembering the past but exists as a feeling that wants to be reclaimed. The shots are brimming with the promise of yesterday as Eddy Kim can be seen in deep contemplation. This debut single from Eddy Kim serves as a welcome addition to the K-pop scene. The video isn’t the most excitingly flashy video, but its low-key production fits the musical accompaniment. The draw of this video is in how relaxed Eddy Kim is within the city. He plays in different corners of the metropolis and interacts with the populace. It has the indie vibe but with a higher production value. Overall, the music is the focus, and it shines in this MV.